I would not say that he was “truly great”, but yes a very good leader. He arrived with a couple of immediate advantages: he predecessor John Akers was almost a complete disaster; and he came in as a total outsider into a moribund culture and a declining company. So he had the chance do do a much needed turnaround, at which he succeeded admirably. I think that is his strength, rather than leading an ongoing corporation. So different leaders are required at different times for different purposes. And Gerstner also knew when his task was done and when to depart the scene. That’s quite interesting. So, he so was almost an interim CEO, good at turnaround and once he had fixed the problems, he would have moved on. At IBM, at 60 most CEOs retire, so even though he was only there for 7 years, he passed the baton and moved on. I wander whether he would have stayed on if he was any younger. Probably not, as I think you are correct that different leaders are required for different skillsets etc. I would hardly call 7 years interim. He was CEO a lot longer than his immediate predecessors. He was also the first CEO that didn’t come up through the company. He also didn’t play games with the P&L like a lot of his predecessors did. In the case of a huge company like IBM, I would consider this “interim”. There was a huge mess to sort out globally. A major turnaround takes a lot of time, especially when most things are messed up. Bob, I have to agree with Frank on the ‘interim’ bit and his last comment, while acknowledging that one of his strengths was the fact that he was not an existing IBMer and an outsider. That allowed him to bring a fresh perspective and analysis which he may not have done if he carried any existing baggage. That is by no means any reflection on any of the IBM staff around when he took over, merely an analysis based on the fact that if you have been part of a company for a while, you also become that culture by inheriting the thinking processes that prevail at the time and are loyal to ‘the system’ however dysfunctional it maybe. I can only speak for the time he spent with IBM. For me there is no debate. Absolutely a great leader, with great skills who led our great company in exactly the right direction, at the right time and pace. His ability to embrace all that was good about IBM and yet make just the right adjustments was perfectly balanced. No room for improvement there and his results speak for themselves. Beth, thanks for your feedback. That is exactly what I thought as well but when I was checking comments on the book itself on Amazon, many IBMers were disputing that. For me, anyone who could bring IBM back from the brink of bankruptcy should go down as one of the greatest leaders that IBM ever had. So, thanks for the feedback..
Elmootazbellah Elnozahy added: I joined in 1997, so I caught the tail of his tenure there. By the time I joined, IBM was out of the ditch, and the boom was about to break. I say during that time, IBM failed on many fronts to capitalize on the new business models that were created by the Internet boom. We have pretty much stayed where we were in terms of focus, and we did not play a role in the same way that other companies did. You can argue this was positive or negative. Gessner also cancelled the traditional pension plan, which riled a lot of employees against him. They backpeddled later by allowing those who were older than 40 to keep the plan, but the damage was done. Some of that could have been avoided. It was inevitable that Louis Gerstner would end up upsetting someone, somewhere once he had chosen to implement such a huge change management programme as broad as it was, covering areas such as the internal culture right the way through to management. The negative impact of many decisions in many areas, perhaps could have been managed better but Louis Gerstner had a huge task to tackle: Return IBM to profitability. In my view, he did that to his best ability. The job for life and associated perks had to go; a tough call, nevertheless, one that he made and as you suggested, he did reverse decisions in some areas. As you said, inspite of all that, IBM missed the social media wave etc when it inevitably came around. That was the past, the question is whether IBM has its finger on the pulse now and is ready to ride the next wave. 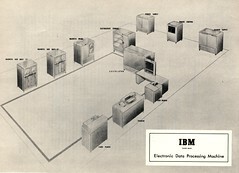 The past is the past and I suppose in many ways all IBM can do, is look to the future. Has IBM really learnt lessons though? Mubbisher, this is an article from three years ago. We announced this month A View from Beneath the Dancing Elephant: Rediscovering IBM’s Corporate Constitution. It is a new perspective on IBM given the distance of time of Lou’s leadership and a view from beneath. Information on the book such as the preface, how IBMers helped design the cover and IBMer reviews are available on the book web site. You may be interested in this new perspective. Thanks for sending it across.